Big tobacco makes about $36 Billion globally each year while accounting for millions of deaths and untold illnesses and medical expenses. It has been banned from planes, parks, restaurants, etc. and the restrictions get tighter every year. Yet tobacco companies and users continue to find loopholes. Alcohol was prohibited in this country for 13 years despite being a staple revenue stream and this drove the illegal production and distribution. So, what if football was abolished? Would people still find a way to play and profit? Would underground leagues appear? Would it be pirate broadcast over the internet? Would unforeseeable problems would result from banning football? 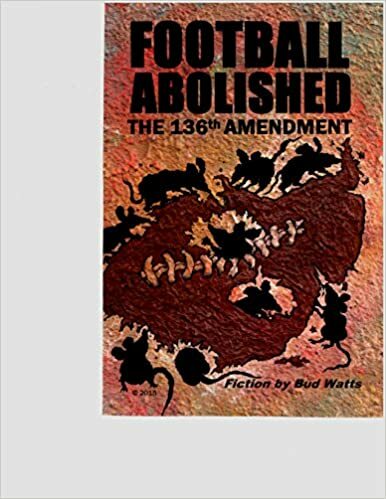 Author Bud Watts is a huge fan of the game. But he has noticed the decline in popularity and youth participation and started thinking of the long-term ramifications if the current trends continue. His fast-paced novel takes place in the very near future and paints a picture of society where football is abolished but still beloved by many. His satirical approach makes you laugh and think. Cassandra's Review- First you need to enjoy or even like football because this book uses this as a catalyst of sorts. It has dry humor and sarcastic writings in this super thick intensely long book. The stories are true to life and the writing style is pure. Either you're going to clear a few days to read this or a few hours each day to get through it. There is bad language and is is created for adults only. There is so much included like double meanings and satire that this becomes a deeper thinking book which in itself will have you losing time. I would recommend this book for people with too much on their minds because it will distract and at the same time clear your mind by bringing in a massive flow of un needed knowledge as well as information.